I experiemented with a different design on my card base at first using Baroque Motifs swirly design. 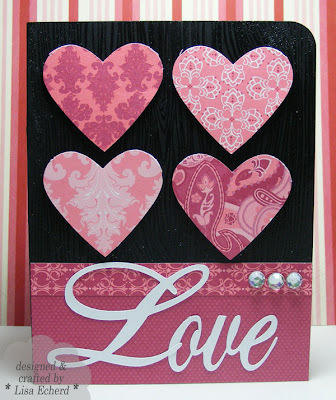 It turned out too busy for the hearts but I have 2 great card bases for another color idea I had earlier in the week. Don't you wish there was more time for all the ideas? I'll just add them to the many piles of partially completed projects in my scrap room. Cardstock: Basic Black; white from Staples for the letters cut on the Cricut with SCAL using English Vivace and Edwardian Script fonts in bold. this is such a pretty card and great dsp. I have the same dsp and want to use it up-I may "borrow" your idea.